Naturally I had to first research how exactly the original game played since I hadn't played it myself in over 20 years. Unfortunately not having an Amiga to play it on I had to resort to internet research. With some searching online I did find that someone had already implemented a version of this game for Android phones which was pretty good (and even had the original music), but it didn't quite have the feel of the original, and I did still want to do my own version of it for the web. Another useful source I found was a (poor quality) YouTube video of the original game. 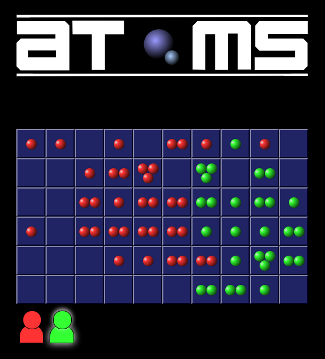 Armed with this information I set out to create the atoms-www project. In creating the game I got the chance to play with some web technologies that I hadn't had much experience with yet. Scripting CSS Transitions was fun, if a little challenging - at least until a friend explained the weirdness of double rAF (requestAnimationFrame). Combining the transitions with the transform property allowed for some nice animations mimicking the original game. CSS Grid Layout was very pleasant to work with, avoiding the need to use a <table> element for the game board, or another similarly evil hack. 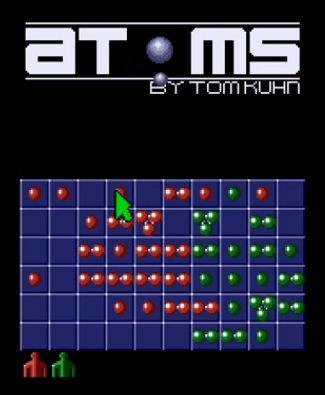 The atom visuals themselves were simple CSS border-radius and CSS radial gradients with the aforementioned scripted CSS transitions to move them into the right places each time an atom is added to a cell. The only places SVG was used was for the logo and the coloured mouse pointer images. No bitmap images were used at all, aside from the favicon / shortcut image. Since then I've worked on polishing the game experience, adding the ability to play against computer players (or even just set 4 computer players fighting each other). I added a debug mode to allow me to compare my implementation with the video of the original (for which Vivaldi's tiled tabs feature was incredibly useful) which led me to fix a bug related to conservation of mass (and rediscover a bug in the original game in the process). After more than 11 years working at Opera Software I have decided to move on. A difficult decision to make to be sure, but I'm really looking forward to my new job. As of June 2018 I start work as a Backend Developer at Vivaldi Technologies AS. As well as working at Opera Software, I also sing in an amateur choir that performs opera music (these two things are only loosely related). Imagine if you will, the hypothetical scenario where your newest JIRA admin has just managed to delete a custom field from your JIRA instance. This of course means that all data stored in that field has been deleted across all issues in all of your projects, and all the schemes and configurations it was referenced by will no longer reference it. So, after revoking this hypothetical admin's administration privileges, what is your next step? Like any good system administrator, you obviously have full database backups running on at least a nightly basis, so almost all of the data is there and can (at least theoretically) be recovered. But you don't want to restore the entire database, otherwise you would lose all data for today, which would be very bad. You have to manually re-integrate the field into all the field configurations and screens that it used to be in. The ID of the field will have changed, so if the field is referenced by any workflows, scripts or filters by ID then all of these things will need to be fixed manually. This guide is written for JIRA admins who are using a PostgreSQL database as the backend of their JIRA instance. If you're using a different database engine you will need to make various adjustments. First things first, get that database backup file and copy it to some server or workstation where you can safely mess around with a database without consequence. Find the ID of your now-deleted field: select id from customfield where cfname = 'My custom field'; (for this hypothetical scenario, let's assume the ID was 10141). Copy these SQL files over to your JIRA server. Back up your JIRA database! Trigger an extra special run of your trusty database backup script. Start your JIRA instance up again. Check to see if everything looks okay. Hopefully breathe a huge sigh of relief. Set a re-index going, just for good measure. This is JIRA we're talking about after all. Website design and content copyright © 2002—2019 Thomas Pike.